MCLV-2 Low Voltage Motor Control Development Board Integrated features such as DSC core and innovative peripherals provide developers with the tools they need to design advanced motor control systems. Asynchronous Stimulus Review of steps to use the asynchronous stimulus in MPLAB software as well as ability to use to debug applications. 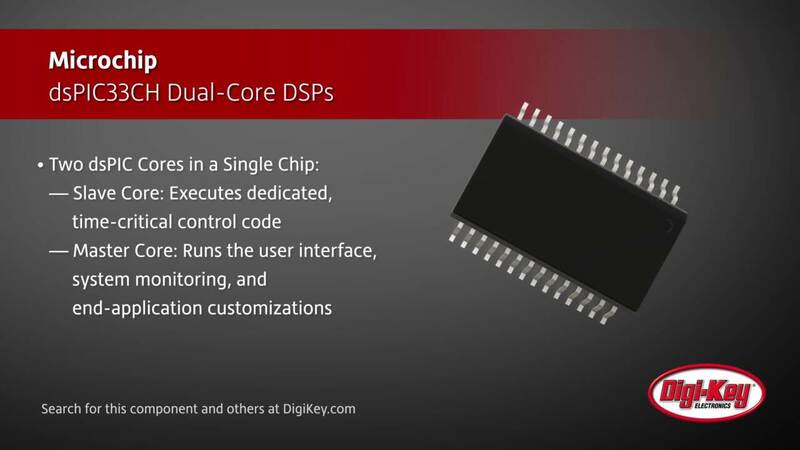 16-bit PIC® MCUs and dsPIC® DSCs with Core Independent Peripherals Overview This training will introduce Core Independent Peripherals in PIC® MCUs and dsPIC® DSCs and discuss their value propositions. dsPIC® "GS" DSCs Microchip's dsPIC33F GS series of digital signal controllers feature power supply sequencing and hot-swap control and are a fully programmable, flexible solution. MCP1630 Boost Mode LED Driver Demo Board Microchip's MCP1630 boost mode LED driver demo board is a step-up, switch-mode, DC-DC converter used for power LED applications. Using MCUs in Signal-Processing Applications A look at digital signal controllers (DSCs) capable of overcoming the difficulties presented by DSP algorithms including products from Freescale and more. Migrating to Digital Power Conversion and Management for a Greener Future Energy management through digital power control. Moving to the Digital Domain for Power Conversion Transitioning to a digital domain for power conversion is a complex process but has many benefits including adding efficiency and flexibility to your design.